Use Aurifil 28wt Mako Cotton Thread when you want your thread to add an extra visual pop to the patchwork top. And use Aurifil Mako 50wt Thread in the bobbin, loosening the top tension to adjust for the difference in weight. 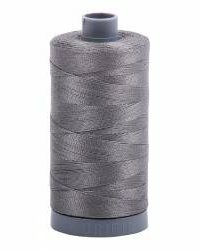 Also suitable for 2 Strand Cross Stitch, Blanket Stitch Hand Applique, Hand Piecing, Bobbin and Machine Lace, and Serging.